In 1924 D.H. Lawrence wrote in a letter: “I want to go south, where there is no autumn, where the cold doesn’t crouch over one like a snow leopard waiting to pounce.” His time in Italy fostered a rich collection of poems that embrace the sensuality of nature and the vitality of a sun that he followed in his travels in southern Italy. And behind his wildly observant poetic images, he illuminates the complexity of human relationships with the intensity of that mediterranean sun. In Where There is No Autumn, William Neil has created a musical setting of “Southern Night”, “Pomegranate” “Peach” and “Tropic” scored for narrator, clarinet, piano and digital acoustics. Neil transforms Lawrence’s in the moment, first person narratives into a rich spectrum of sonorities that orchestrate the spoken word with the full dynamic capabilities of the clarinet and piano. The ensemble is enveloped in the digital sounds that are heard through speakers on stage. The acoustic sounds are cued from the composer’s laptop and are really compositions in them selves inspired by the images that Lawrence evokes in his poems. Neil has composed and recorded music that he created on the Kawai grand piano in his studio that were then sculpted and processed to create the desired sonic elements that make the complete mosaic of the live performance. Neil worked closely with the narrator John Worthen and Bethan Jones, the clarinetist during the composition to create pieces that can be easily rehearsed and performed during their residency at the D.H. Lawrence International Symposium in Gargnano, Italy on September. “Southern Night” opens with a very ritualistic treatment of the text, the digital part developing a tension that explode into the brilliant clarinet and piano gestures. In “Pomegranate” each of the references to location, Syracuse, Venice and Tuscany in the poems are as treated as separate musical events. The poem ends with Lawrence’s challenge to the reader to fully appreciate the sensuous experience of breaking open the fruit and enjoying its colourful splendour. Here, Neil combines all three of the previous acoustic settings in a cascade of piano and clarinet trills that ends in a slow, contemplative, harmonic constellation that resolve when the clarinet reaches its final note. “Peach” enlivens the tension that Lawrence creates in his question and answer formant of the poem with the very dynamic and dramatic digital part with the piano and and clarinet resonating each of the questions. 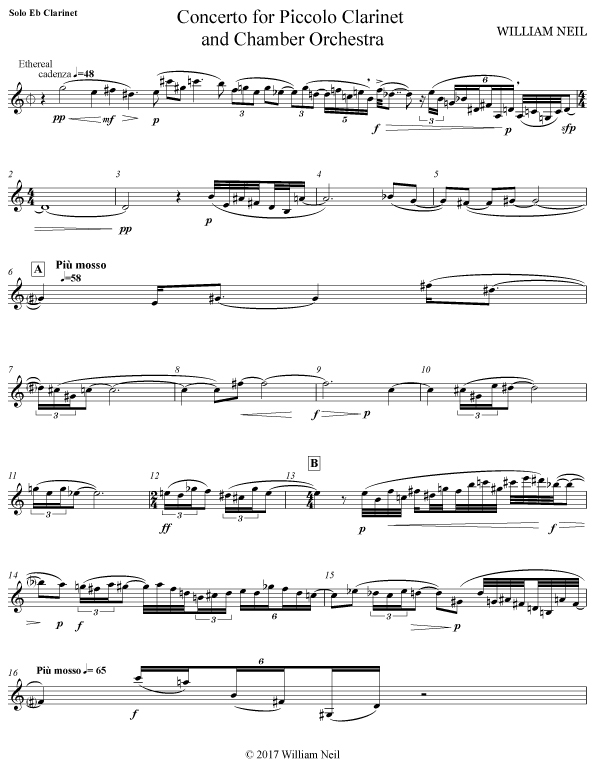 In the final piece, “Tropic”, Neil combines three manifestations of a rhythm that correspond to the Lawrence’s reference to the ” horizontal rolling of water” with two rising themes in the clarinet that evoke the “the flood of black heat”. Come up, thou red thing. Come up, and be called a moon. Do you mean it is wrong, the gold-filmed skin, integument, shown ruptured? I am thinking, of course, of the peach before I ate it. Behold my hair twisting and going black. As frictional as perilous, explosive brimstone. Compared to the flood of black heat that rolls upward past my eyes.